Top male dog names to choose from when deciing to name your new puppy! If you have a dog treat business, use these popular dog names to create samples of a dog birthday cake or treats for dogs to advertise your dog bakery. 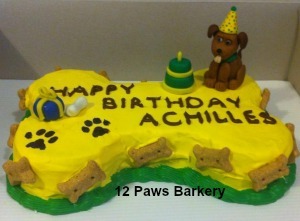 The cake shown in the image was made for a dog named Achilles by 12 Paws Barkery. When choosing a product to write a name on a cake, make sure to use one that is created for that purpose. We recommend Magifrost dog cake frosting not only to frost the cake, but to use for writing as well. According to a list on a popular website, these popular names have not changed much over the last five years. Use any of them and your exhibit is bound to catch the eye of potential customers. If you can create an emotional response to your product in your customer, the chances for a sale increase. When you exhibit at farmers markets, write popular names with dog treat icing on a sample cake and treats for dogs. Using a pet name that means something to you but not to your customers will not provoke the same "Oh my baby would love that dog cake!" acknowledgement. They see their baby's name on the cake, they see the finished product, and they start to envision their baby eating that cake! So without further delay, here is the list of the top names for dogs. Celebrate your new pet and bake him or her a dog cake! Find dog cake recipes here. Find healthy dog treat recipes here. Visit K9Cakery.com for mixes, dog treat icing, and unique baking pans to create your own dog treat masterpiece!